Our kitchen faces the driveway of our home, so I am always aware of when someone is walking to the back door. I was always seeing someone come down the drive. I always waited for the knock on the back door. When no knock occurred, I would naturally go to the back, open the door, and no one was around. I also saw this ''person'' in the back window that faces the yard. I was wondering who was coming to the door by cutting through the yard; again no knock and no one around. I never got a really good look at this person. It was always an ''out of the corner of my eye'' look, but I knew it was male, older, and in work clothes with a hat. I thought it was just me, but then my son stated that he was always seeing a man walk down the drive and wondered who it was. I knew he was seeing the same person. We decided we had a ghost attached to our house due to the house next door. Our neighbor's home was from 1861 and surely has some history to warrant a friendly ghost. After that it was no big deal. We would see him and say 'hi. ' Sometimes it would appear that he was pushing something or have something slung over his shoulder. He is still working after all these years. 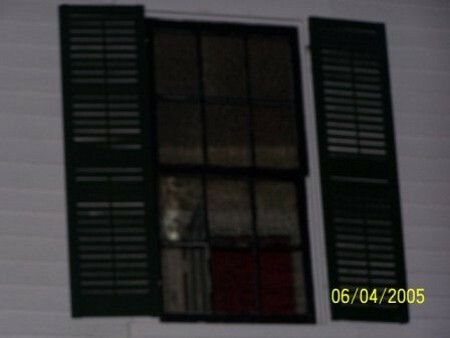 Due to the age of my neighbor's house, there was always curiosity by folks and questions as to if it were haunted. I would tell people about our driveway friend, but that was not as interesting as what people wanted to hear about. One fall evening my family hosted a party and a bunch of folks brought their cameras to see if they could capture a ghost. ''Good luck'' was all I could think. Next thing I know there was screaming next door, and the ghost busters came running back in. They had captured scary faces on their cameras. I will admit that some of the pictures were unnerving and very clear as being human faces, but ghost or no ghost, they stayed their place, and I was happy with that. I asked that no more pictures be taken as it was my neighbor's house, and enough was enough. I was feeling more and more uneased as the evening went on. Well a few folks slipped away and began taunting to see if they could get some ''action'' pictures.